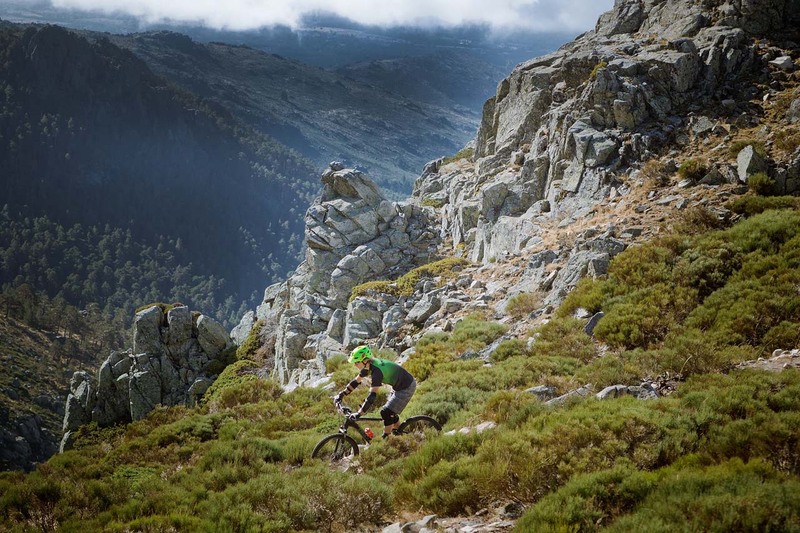 [gpp_tabgroup][gpp_tab title=»English»]Thinking of Mountain Bike tours? Spain can be a serious option and surprisingly Madrid is one of those hidden paradises of trails and many other amenities. Sierra de Guadarrama mountains are located just 50km from the city. Last week we even escaped a morning to make one of the longest and amazing descends across La Barranca valley. By 10am we were parking our car in Puerto de Nacacerrada, after a short 1km climb we started the downhill with a rock garden zone by La Tubería (The Pipe) trail which is one of the most famous and technical trails in the zone, its name comes from a water pipe that crosses it all along the descend and you must be careful because it’s easy to fall and you don’t want to fall in a rocky zone. During this part of the downhill you must wear some protection. After La Tubería comes the Ortiz trail, here starts the flow, once you enter the pines your bike starts to carry speed and tons of fun. If fog let’s you, you’ll be able to see the whole valley as you ride, but that’s only if you are able to turn your head instead of keep watching the trail. Right after Ortiz comes one of the other amazing and famous trails of Sierra de Guadarrama, Alakan trail, his name comes after one of the most famous MTB riders of Madrid and it deserves its fame, it’s a trail with funny ups and downs that will make you scream as you increase the speed. Not soon you’ll arrive to a small reservoir and we’ll take a fast link by a gravel road to enter a part of El Camino de Santiago (the Path of St. James). As soon as you notice that your arms burn, you’ll see that we’d had descended more than 1200mts and have been 3 hours riding and having fun. If you want to ride only the descend you better have a uplift that we can provide. If you are interested in more details of our packages please visit our TOURS page. Take a look at other photos of our tours in our GALLERY page. Enjoy the photos in this post and leave a comment below if you liked them. [/gpp_tab][gpp_tab title=»Español»]Si has pensado en ir a de vacaciones con tu MTB a Los Alpes es probable que sea por que no conoces bien la Sierra de Guadarrama. El valle de La Barranca es uno de esos secretos que solo está al alcance de los mas aptos. Después de La Tubería viene la Senda Ortiz, un sendero con todo el flow que nos lleva entre los pinares con el valle de fondo. Si es que eres capaz de desviar la mirada del sendero podrás disfrutar de las vistas. Al final de Ortiz entraremos en la famosa senda Alakan, que debe su nombre a uno de los riders mas famosos de la comunidad de Madrid y que cuenta con numerosas exploraciones que publica en su blog y en Wikiloc. Esta senda nos lleva por un constante sube y baja que aumenta su diversión exponencialmente. No pronto llegaremos al pequeño embalse del ejercito del aire y haremos un rápido descenso por una pista hasta llegar al Camino de Santiago, tan pronto como empieces a notar que los brazos te queman te darás cuenta de que llevamos 3 horas bajando y que hemos descendido mas de 1200mts.